Sanai is one of the earlier Sufi poets. He was born in the province of Ghazna in southern Afghanistan in the middle of the 11th century and probably died around 1150. 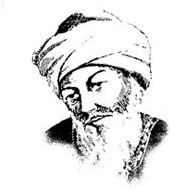 Rumi acknowledged Sanai and Attar as his two primary inspirations, saying, "Attar is the soul and Sanai its two eyes, I came after Sanai and Attar." Sanai was originally a court poet who was engaged in writing praises for the Sultan of Ghazna. The story is told of how the Sultan decided to lead a military attack against neighboring India. Sanai, as a court poet, was summoned to join the expedition to record the Sultan's exploits. As Sanai was making his way to the court, he passed an enclosed garden frequented by a notorious drunk named Lai Khur. As Sanai was passing by, he heard Lai Khur loudly proclaim a toast to the blindness of the Sultan for greedily choosing to attack India, when there was so much beauty in Ghazna. Sanai was shocked and stopped. Lai Khur then proposed a toast to the blindness of the famous young poet Sanai who, with his gifts of insight and expression, couldn't see the pointlessness of his existence as a poet praising such a foolish Sultan. These words were like an earthquake to Hakim Sanai. He abandoned his life as a pampered court poet, even declining marriage to the Sultan's own sister, and began to study with a Sufi master named Yusef Hamdani. Sanai soon went on pilgrimage to Mecca. When he returned, he composed his poetic masterpiece, Hadiqatu'l Haqiqat or The Walled Garden of Truth. There was a double meaning in this title for, in Persian, the word for a garden is the same as the word for paradise, but it was also from within a walled garden that Lai Khur uttered the harsh truths that set Hakim Sanai on the path of wisdom. A brief biography and several excerpts of his writings. An extended biography and discussion of the poetry and philosophy of Sanai. A few poem selection by Sanai, as well as several other great Sufi poets.